This Level 4 module will help you understand the importance of effective internal and external communications in building sustainable relationships and explains how the concept of Integrated Marketing Communications (IMC), product and brand management can enable organisations to deliver customer value. This qualification is aimed at those who are working in supporting marketing roles, usually within the marketing function, but also targets individuals in more senior roles, particularly in SMEs, where marketing is only part of what they do. The qualification provides a practical insight into the principles and application of marketing at a tactical level. Marketing managers in SMEs without formal marketing qualifications. Non-marketers with aspirations for marketing. Existing marketers wanting to become more specialist. 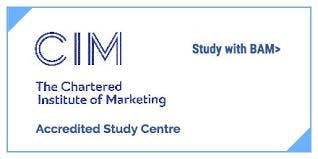 CIM Foundation Certificate in Marketing.